Save your spot for this special Greeters - RSVP REQUIRED! 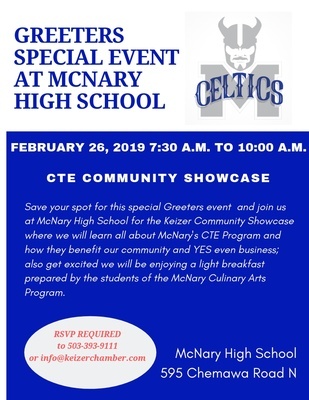 Please join us at McNary High School for the Keizer Community Showcase where we will learn all about McNary's CTE Program and how they benefit our community and YES even business; also get excited we will be enjoying a light breakfast prepared by the students of the McNary Culinary Arts Program. RSVP REQUIRED no later than February 7, 2019 by registering for this free and informative event.